Bill Gates in the Kingdom — What Was Learned? “Vini, Vidi, Vici” or “I came, I saw, I conquered” were the immortal words attributed to Julius Caesar when he conquered the rebellious province of Asia Minor. 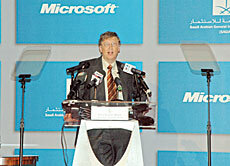 Bill Gates, the chairman of Microsoft visited Saudi Arabia not too long ago. Paraphrasing those words of Caesar, he might as well have said, “I came, I saw, I marveled”. He must have marveled at the latent energy and potential that lays in the Kingdom, to transform itself into a truly modern, dynamic, skills-based economy and bring out the best in Saudi society. He met the mighty and the good of the land, and he must have marveled at their eloquence, sincerity and belief that everything is possible. And yet, what was learned from his visit? Are we nearer to understanding this unique individual’s vision and his next revolutionary ideas? Are we ready to share with him in transforming some of those dreams into reality, or will he soon marvel at some other country on the globe that is willing to accept the necessary mindset changes that goes with Bill Gate’s vision? For those that met him in the Kingdom, they too must have marveled at the simplicity and humility of this man. Who else in the world has so openly stated that he is giving up nearly all his wealth — a cool $32 billion — to the world’s poor through his endowment and charitable foundation? For that alone, we too must marvel. And yet Bill Gates was a college drop-out in Seattle ,when he and Paul Allen founded Microsoft more than 30 years ago. The rest is history, as they say. During his visit to the Kingdom, Gates urged Saudi Arabia to make a solid commitment to educational reform and the pursuit of excellence, and encouraged a vibrant partnership to develop energy sector software to leverage on the country’s expertise in oil and gas production. He pledged the full cooperation of Microsoft and its resources in realizing this vision together. Buoyed by this, grandiose plans are now being made to transform the nation into one of the world’s Top 10 most attractive investment destination and preferred IT technology location, by the year 2010. That does not leave much time to set in motion the necessary educational restructuring and connectivity to the global information superhighways that Bill Gates alludes to. This is when individual countries develop a niche expertise in their IT industry to connect with other international companies, such as Saudi Arabia’s inherent comparative advantage in the energy software sector, and whereby a world class market leadership can be developed. Once again, it takes a perceptive person to point out that these changes can only be brought about if a massive commitment to improve education takes place — as well as the nourishing of more than one world-class university to generate a critical mass of qualified labor force and a research and development culture. This, according to Gates, requires openness, transparency and incentivizing those who contribute to intellectual property development, as well as attracting some of the best academic brainpower in the world to Saudi Arabia. Microsoft and Gates are already thinking about the next steps in the fast evolving IT revolution. For Gates, the next revolution is not in the content of websites, but the way we physically interact with computers; with the keyboard and the mouse giving way to speech, touch and mobility. The pace of innovation will be that much faster in the next 10 years, than what we have seen in the past, and this will leave some societies behind who do not begin their educational transformation from now. Very soon, we will take for granted computers capable of examining and telling the differences between objects, and a smart surface on which documents, maps and videos can be manipulated by hand gestures; or everyday objects such as mirrors, which can remember and display people who have looked at it. Development is only constrained by one’s imagination, and imagination and querying matters can only come from an educational system that encourages and nurtures such traits in young people. In two years time, Gates will step down from his day-to-day role at Microsoft to concentrate, with his wife, on their Bill and Melinda Gates Foundation. Until then, Gates will stand by his new found friends and co-visionaries in Saudi Arabia. Like him though, time is not on everyone’s sides to effect some of the necessary changes in the Kingdom, otherwise very little was learned from his visit.